With the rollout of new, preservative-free tortillas last week, Chipotle declared itself the only national restaurant chain that doesn't use added colors, flavors, or preservatives in any of its food. Now, the the burrito purveyor is hammering that message home with a game that'll reward you with a free order of chips and guacamole if you can spot the hidden artificial ingredient on its website. The game is aptly called "Spot the Imposter," and it's super easy. All you have to do is visit Chipotle's Real Ingredients page and search through the visual list of 51 additive-free ingredients to spot hidden industrial preservatives, artificial colors and flavors, gluten, and gums often used in fast food menu items. Once you find -- and click on -- the hidden additive, Chipotle will send you a mobile coupon via text message for a free order of chips and guac with the purchase of any entree. The deal is good through April 30. Chipotle said the game is available to play from Monday, April 3, through Friday, April 7, and that it'll add a new hidden additive to the list of ingredients each day at 9am. 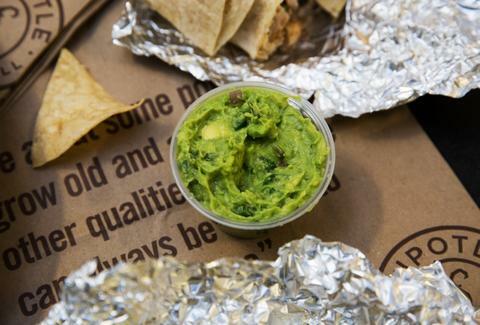 Although you can only get one free order of chips and guac per mobile number, finding the new "imposter" ingredient each day will earn you an additional entry (up to five in total) in Chipotle's sweepstakes to win free burritos for a year or free dinner for 10 people, according to a press release. All said, the free chips and guac giveaway with the game isn't as enticing as the chain's previous free food deals because it requires you to buy an entree. But at least you'll get a little something extra the next time you grab a burrito bowl for lunch. Tony Merevick is Cities News Editor at Thrillist and could really go for a burrito bowl right now and it's only 10:30am. Send news tips to news@thrillist.com and follow him on Twitter @tonymerevick.